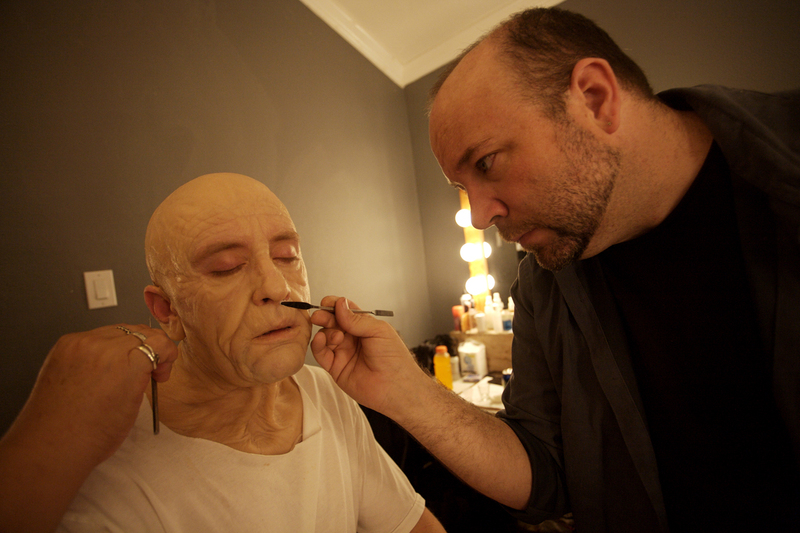 Academy Award®-winner Barney Burman was literally born into the world of make-up. His grandfather, Ellis Burman Sr. was a true pioneer and created make-up effects before there was a name for it. He made prosthetics for films like The Wolf Man (1941) and House of Frankenstein (1944), animatronic animals for Rudyard Kipling’s Jungle Book (1942), masks for Rod Serling’s The Twilight Zone (1959-1963) and much, much more. Thomas R. Burman, Barney’s father, won multiple Emmy awards for various television shows and received an Oscar Nomination in 1988 for Scrooged. He started using Barney to make creature suits over for TV shows like Lost in Space and films such as Food of the Gods (1975), Close Encounters of the 3rd Kind (1977) and Invasion of the Body Snatchers (1978). This just might account for Barney’s penchant of performing as well as his love for the art of make-up effects. Thus Barney formed a plan of attack. “I wanted to be the best make-up artist I could be and I didn’t want to rush into opening up my own studio and go through making creatures and characters I felt were sub par.” For the next nine years, Barney jumped around from production to production working for and with some of the best artists in the business and on some of the biggest shows in town. Rick Baker (How the Grinch Stole Christmas, Planet of the Apes, The Ring 1 and 2), Ve Neill (Pirates of the Caribbean, Constantine), Ed Henriques (Master and Commander: The Far Side of the World), Greg Cannom (Bulletproof Monk), and Michele Burke (Austin Powers in Goldmember) are just some of the talents Barney had the great fortune of collaborating with and learning from. 2007 was the first in a series of banner years for Barney and Proteus FX. Several high profile projects came their way, including Tropic Thunder, for which Barney designed the make-up transforming Tom Cruise into the abusive studio head Les Grossman, and JJ Abrams’ new vision of Star Trek, for which Barney just received his first Oscar and a Saturn Award given by the Academy of Science Fiction, Fantasy and Horror Films. Currently Barney has several projects in various states of development including a werewolf script, a project with a major cable network and, one of his favorite things to do, a film with lots of age make-ups. Barney is a proud member of IATSE Local 706 as well as the Screen Actor’s Guild.